Implementation science is an important and underrepresented topic in the literature of educational research, despite the fact that it is inextricably tied to education policy and improvement. Implementation fidelity (the degree to which a program or intervention is delivered as planned) is, in particular, a key issue for every program developer and researcher designing, executing, interpreting, or communicating their work. Implementation Fidelity in Education Research provides the first serious developer-evaluator collaborative perspective on the practical considerations of implementation fidelity in program development. Using case studies from Investing in Innovation (i3) fund grants, this book prepares future researchers for the challenges posed by implementation issues both ideologically and in practice. 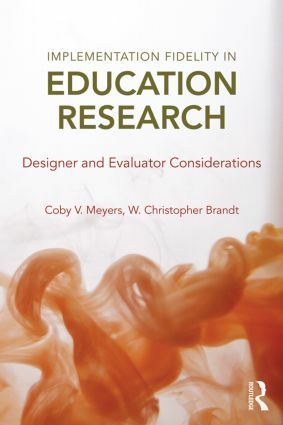 This book will be an excellent resource for anyone interested in education research and evaluation and an excellent supplement to research methods courses. Implementation Fidelity in Education Research is a useful guide for program implementers and program evaluators working in schools, districts, research and evaluation companies, institutes of higher education, and state departments of education. Based on the experiences of those working on projects funded by the federal i3 program, this book is full of practical solutions to real problems encountered by those tasked with making programs work or with evaluating them. The authors are candid in their recommendations and offer a fresh perspective on a long-standing challenge. Graduate students and seasoned professionals will find the book a very worthy read. Chapter 1. Introducing This Book on Implementation Fidelity in Education Research. Chapter 2. Introduction to Implementation Fidelity. Chapter 3. EDUCATION CONNECTION’s Center for 21st Century Skills: Development of an Evidence-based Technology-enhanced Blended Learning High School Program. Chapter 4. STEM21 Digital Academy Fidelity of Implementation: Valuation and Assessment of Program Components and Implementation. Chapter 5. The eMINTS Professional Development Program and the Journey toward Greater Program Fidelity. Chapter 6. Placing Evaluation at the Core: How Evaluation Supported Scale Up of the eMINTS Comprehensive Program. Chapter 7. Success for All Design and Implementation of Whole School Reform at Scale. Chapter 8. Measuring Implementation Fidelity in Success for All. Chapter 9. Measuring Fidelity: Present and the Future. Coby V. Meyers is a Senior Researcher in the Education Program at American Institutes for Research. W. Christopher Brandt is Executive Director of Assessment and Accountability with the St. Charles School District #303 in St. Charles, Illinois. Previously Dr. Brandt was a Principal Researcher in the Education Program at American Institutes for Research.